Are you ready to attend summer bbqs this summer? Having a peanut allergy or food allergy can make eating with friends difficult. 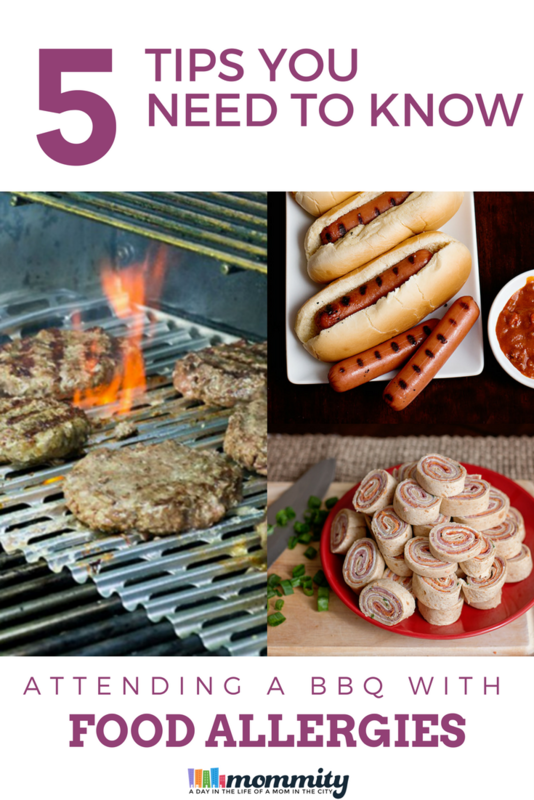 I’ve got you covered with these 5 tips for eating safely at a bbq, while enjoying yourself. How do you eat safely at a BBQ with food allergies? I’ve been there and know the fears that come with eating at events. These events will be a part of my son’s life, they will never go away and I don’t want him to feel left out just because he has an allergy. We are learning to deal with nut allergies and have been teaching our son how to have a good time all while being safe with the food around him. Talk with the host before attending – If you are going to a summer event, more than likely it is being hosted by a friend. My husband and I talk to the host before attending and remind them about Andrew’s peanut allergy. I will often ask about what foods are planning to be served and if there will be foods there that are peanut and tree nut free. Most times the host will take extra precaution to use ingredients that don’t contain peanuts (or other allergens) or if they do have peanuts they will make sure we know so extra precaution can be taken on my part. Bring “Safe” side dishes or desserts – Often times I will offer to bring a side or some festive cupcakes so that I know there will be a few things there that are safe to eat. Our child is a really picky eater anyways so this usually works in his favor. Take precaution on the grill – Some BBQ sauces will contain peanuts, thus leaving the grill cross contaminated. They make disposable liners for the BBQ that are great for avoiding food allergens. Simply place the liner on the grill, have your food cooked and then it can be thrown away. Eat before you go – If we are going to a BBQ that will be covered with desserts that contain peanuts, or a wedding where you don’t really feel comfortable asking for accommodations, we will often feed Andrew before going. It’s better to fill his belly up beforehand and then we only have to think about snacks, rather than a meal. Bring Snacks – This goes with the tip above. If we are there for a long time at an event that has very questionable food, we will bring peanut free snacks like fresh fruit, some carrot sticks, maybe some crackers or a small treat. With these tips we have been able to bring our peanut allergy child to many summer events. While we still have fear of “what if” we know that with the proper precautions a great time can be had all while being safe.